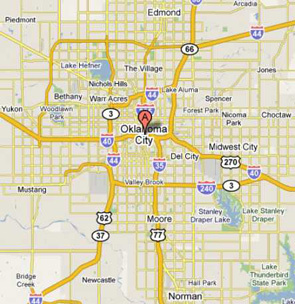 RDS Dumpster Rental works to ensure that renting a dumpster in Oklahoma City, OK is an easy process. We don't believe in lengthy trash removal forms or middlemen taking your order. Call us for a hassle free experience when you need to rent trash or construction dumpsters in Oklahoma City and surrounding areas. When you rent roll off dumpsters in Oklahoma City, don't waste time and energy renting from dumpster services that are not committed to "on time" delivery and pick up. Unresponsive or late garbage dumpster service can be frustrating and cause unnecessary delays in your cleanup project. RDS Dumpster Rental has a strong reputation of delivering roll off dumpsters on time and fast pick up upon request. We offer honest, competitive prices to rent a dumpster in Oklahoma City, Norman, Edmond, Midwest City, Moore, and nearby cities. We don't have any hidden charges. Call us today for a quote! Our dumpster prices include delivery, pickup, and disposal at the landfill, up to the specified weight allowances for your roll off trash dumpster. RDS Dumpster Rental has multiple roll off trash dumpsters to choose from: 10, 15, 20, 30, and 40 yard dumpsters. These trash containers are perfect for cleaning out your basement, garage, or an entire house. Along with general junk removal and trash removal in Oklahoma City, homeowners and contractors will find that 10, 20, 30, and 40 yard dumpsters are an economical choice for most construction debris removal projects as well. Roof tear off and replacement, remodeling projects, demolition work, and more can be accomplished with a temporary dumpster. Call RDS Dumpster Rental today at (405) 384-4635 to rent roll off dumpsters in Oklahoma, Cleveland, and Canadian Counties. Rent roll off trash dumpsters in Oklahoma City, Warr Acres, Choctaw, Harrah, Tuttle, Nichols Hills, Spencer, Piedmont and nearby cities. What Makes RDS Dumpster Rental a Great Local Choice for Dumpsters? Call (405) 384-4635 for Oklahoma City Dumpster Rental Including Del City, Yukon, Bethany, El Reno, Mustang, The Village, Guthrie, and Surrounding Cities.